Monkey Maki!!! I love the name – I was cracking up! Yes, I’m a dork. 😀 This fabulous recipe was thought up by my wonderful reader, Yvo, and I must say it turned out pretty darn well! (Thanks so much, Yvo! 😀 )The banana tempura smelled just like banana bread when I made it (yum!) so with the wasabi mayonnaise it was a nice mix of sweet, salty and spicy. Make sure you get under-ripe bananas, since the banana will get softer when you tempura fry it and then it falls apart when you are tying to get it out of your frying pan. Ours broke in half. 😛 But it’s ok, it still tastes (and looks) just fine! Already… it’s midterms! I can’t believe the quarter is going by so fast! So it might take me a little longer to reply to comments and get posts up next week but don’t worry, I’ll be back! 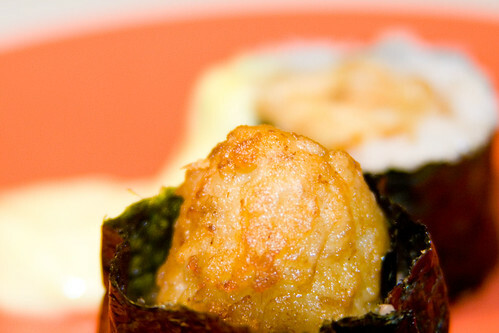 Place the tempura bananas on some paper towels to soak up the remaining grease. Roll the sushi. 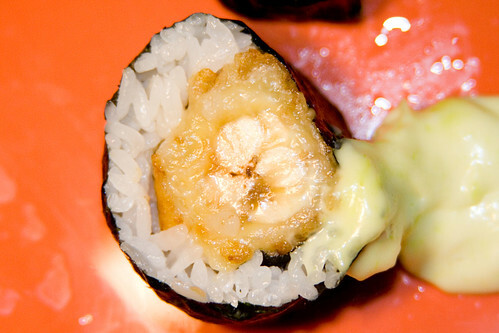 Use the tempura banana as your filling. 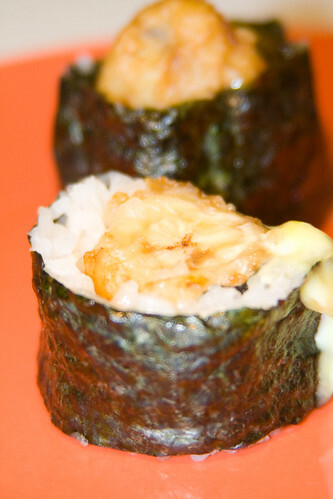 Serve with mayonnaise mixed with wasabi (use however much you want to make it as spicy as you would like it!) Enjoy! reminds me of a roll called an Albino Roll at our local sushi shop…it’s found on the desert menu. 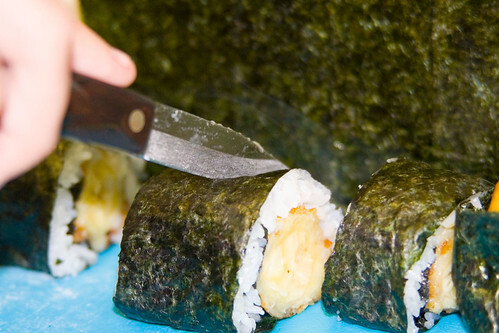 It’s banana and raspberries in a roll and then the whole roll is tempura’d. Mmm, that roll sounds good too (the Albino Roll)! I’m so happy you tried it and it tastes good! I’ll pass along this link. Yummy, banana, rice, fried goodness… hehehe! Ralph – Ooooh that sounds good! I don’t think I have done any dessert sushi yet, so I’ll definitely have to try making some! 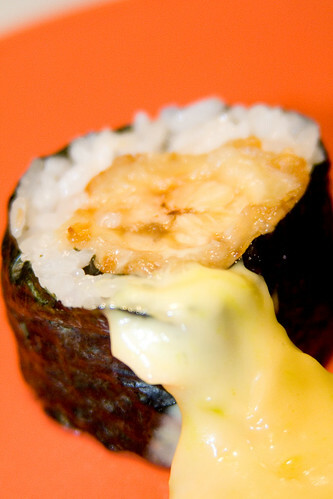 Allison, Yvo: lolzz.. it’s awesome… you do the weirdest sushi. 10+ years rolling sushi, i couldn’t come with something like that. lolz.. simply awesome.